This is a class for beginning and more experienced appliqué students learning the “needle turn” method of appliqué. We will begin our journey with a simple pattern, in the Baltimore style which will produced a finished block measuring 12.5″ X 12.5″. We will progress each month to a new block, and with each block a new skill will be mastered or a secret trick learned, to help you produce a beautiful finished piece. 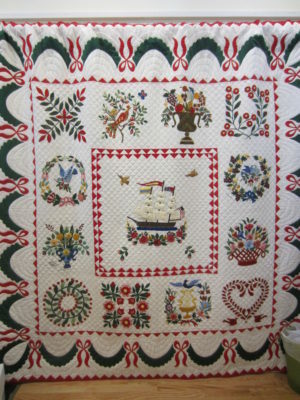 As we complete each block we will slowly increase the level of the difficulty until the last piece when you will decide which design you want for your center block – a basket of flowers or the clipper ship or perhaps the iconic Baltimore Eagle block – your choice.